What kind of dancing? – – – Square Dancing! It Is Fun, Fitness, and Friendship. You don’t just sit around and watch. You are right in there as part of the show, active and enjoying the company of your fellow dancers. It is a fitness activity that lets you have a good time and make new friends. Here’s an activity you can do with your partner that doesn’t keep a score. With other fitness activities, you’re either alone or competing. But when you dance, you’re cooperating; working with others. It is the ultimate togetherness workout. It Is Also Enjoyed By Singles. 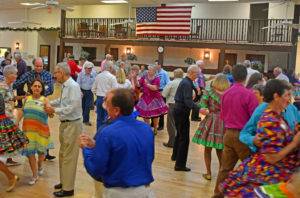 Although square dancing is a couples activity, many singles do participate. Club “Angels” help (partner) during lessons. After lessons, our area has several Singles clubs where an enjoyable evening of dancing and socializing can be found. 1. Go with fun… Consider Square Dancing… See article.